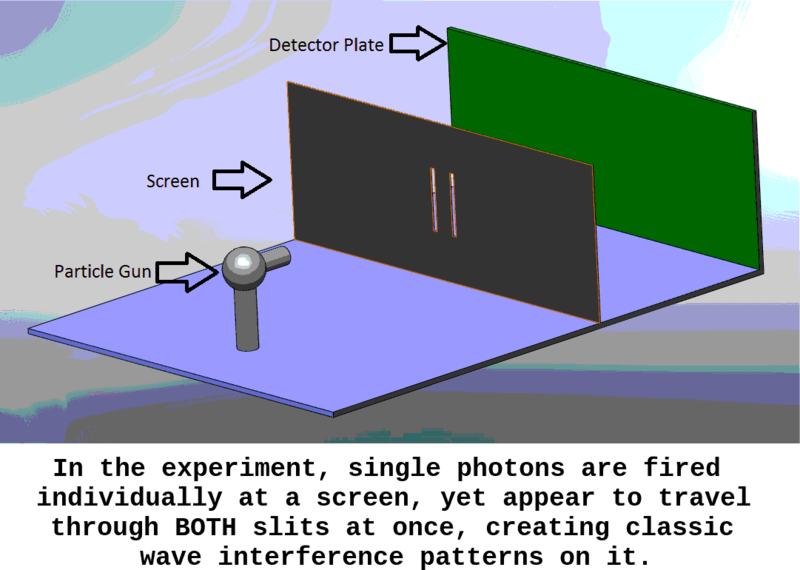 The so-called ‘double-slit experiment’ is a demonstration that light and matter can display characteristics of both classically defined waves and particles. It is also said that it displays the 'fundamentally probabilistic nature' of the universe at the quantum scale. The original intuition of Thomas Young (back in 1802) was to reproduce the cancellation of water waves, but with light; the double slit was simply used to yield two exactly identical light sources (the same, divided in two). Notice the straight lines that seem to radiate from the source of the water waves: they are made of the cancellation of each other, and are analogous to the dark regions on the five-step picture (below), a true depiction of the impact of electrons in an experiment made by Tanamura. 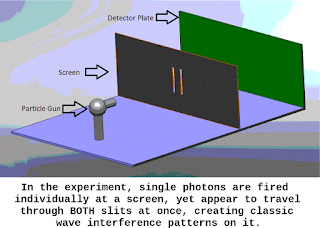 In the de Broglie–Bohm theory (also called the Bohm interpretation) of quantum physics, the reason why single particles seem to interfere ‘with themselves’, in other words, the reason why, in the double-slit experiment, even single particles ultimately form a figure of interference despite of the fact that they are not emitted as beams but one after the other (see the 5-step process, below), is because each of these particles have a kind of pilot wave which does interfere with itself in some circumstances like the double slit apparatus. The analogy of the sonar helps to explain the phenomenon : picture a dolphin who would have to echolocate through two holes and you get the picture! However, what this analogy leaves unattended is the fact that particles do not "send" signals to the surrounding and do not "wait" for this signal to bounce back. Another analogy far remote from the sonar one, was given by Bohm : each particle is like a piece of an hologram, each contains information about the whole, but each is concretised in a specific context. The 'echolocation' process would be more like a pulsation between the particle as a located entity and the particle as one concretion of the whole. Pulsating infinitely rapidly between being-discrete and being-the-whole, the particle would be more like a process taking the form of an object. What kind of "thing" can be everything half of the time and something the rest of the time? Humans, for starters. We, as particles, tend to forget that we also are the whole, each night. We dream. My understanding of Bohr’s complimentarity is about how our language is limited by our observational experience but it is necessary for our depicting the world. We have to use the classic language (particles and waves, where an observation has no interference with its objects) to describe the non-classic phenomena (quantum, where an observation does interfere with its objects). It is like that if we have to use the language of Yin and Yang to describe something that is actually neither, we should tell people how they are used in a complimentary way.